My job title and duties are a little different this summer. My friend John has taken a work detail to Nevada for 4 months, and I am temporarily filling in for him as “wilderness manager”. This means I am responsible for the stewardship of 70,000+ acres of Congressionally-designated wilderness, the Alpine Lakes Wilderness which straddles the Cascade Range in Washington. The North Cascades begin here. Because neither John nor my boss is a micro-manager, I can make what I want of this opportunity. What I most want is to manage my little portion of this place from the field. I have no formal crew to supervise, only a handful of volunteers and visiting wilderness rangers to coordinate. An Earthcorps crew is coming for two weeks, and I’ll be overseeing their efforts to deal with backcountry toilets and restore campsites. As a ranger myself, my job is to hike and explore, check on things (trails, campsites, areas burned in wildfires, etc. ), and talk to people. Being close to the urbanized Puget Sound area means that parts of the Alpine Lakes are heavily visited by human beings. I prefer to believe that the wilderness takes care of itself perfectly well without interference from “wilderness managers”. The unpredictable element that requires management is the people who show up to recreate. So for the next couple of months, this blog will be where I track some of my observations about nature and humans and human nature, and whatever else else strikes my funny bone. Topic of the Day = Pests. My backpack is rigged for three nights out. I plan to set up a base camp at Pete Lake and take a different hike each day to scout trail conditions, snow levels, and talk to hikers about wilderness regulations and Leave No Trace outdoor ethics. It’s a warm day, and humid as I plunge into the brush to take a shortcut to the trail. The first pest of the day makes itself known: the earworm. I have been plagued by earworms since childhood. With the invention of transistor radios in the 1950s, it was possible to have music anywhere. Growing up in the 60s, my head filled with popular music of the day, film scores, and commercial jingles. The human brain being the mystery that it is, any of this auditory material is subject to being dredged up at any time. I hypothesize that the rhythm of walking on a trail triggers the remembered rhythms of songs. Thus the earworm comes into being–that fraghment of song that repeats over and over and over in one’s head. My first real experience of this was when I was a wilderness ranger in 1981–my boyfriend was an avid Grateful Dead fan, and I spent four days in the mountains hearing them sing “Truckin'” until I thought I would go mad. Then there was the time the trail crew was given a ride to a trailhead, and the driver insisted on listening to the radio. The last thing we heard before diving into the backcountry was Tom Jones belting out “What’s Up, Pussycat?”. Pure torture. I’ve learned over the years that if I can fill my head with music I like prior to a trip, some of the edge can be taken off earworms. So this time I had the iPod in the truck and sang along with Neil Young “Keep on Rockin’ in the Free World”, and a song by REM that never fails to make me smile–the words are so random and obscure. It’s the one with the good mandolin riff. I thought I was taking good care of myself, but as soon as I was a half mile down the trail here it came: “Super-cali-fragilistic-expi-al-o-docious!” What?! How did Mary Poppins get into my head? And if that wasn’t bad enough, the alternate was “Hi Ho, Hi Ho, It’s off to work I go…” Rock and roll displaced by the Disney medley–why, brain, why??? Which made the appearance of the second pest of the day almost welcome. The mosquito! Yes, it just wouldn’t be summer in the mountains with out this small whining insect. Actually, vast numbers of them. There are two things that happen to water when the snow melts. The first option is that it melts into a stream and runs off into bigger streams. The second option is that it collects in a low spot and creates a pool/puddle/pond/tarn which is the ideal place for mosquito larvae to develop into adults and infest the forest with the buzzing of tiny diaphonous wings. As a naturalist, I understand the biological imperative–live, mate, die asnd ensure the proliferation of one’s species. The mosquitoes’ strategy is that there’s strength in numbers. Despite the multitudes of them that feed birds, frogs, fish, and the multitudes that are slapped to death by campers, there are still multitudes at large. As individuals, they don’t have long life spans. But there are just so many of them. Just now I did a little clicking around the internet and learned that Washington state is home to only 37 species of mosquito (out of 25,000 worldwide). They are adapted to habitats as diverse as willow flats along the Columbia River to irrigated farmland to high mountain meadows. It is this latter that I am most interested in. I found a 1952 Department of Agriculture handbook “Mosquitoes of the Northwestern States” that details the natural history and management of this insect pest. Most of the mountain mosquitoes belong to the genus Aedes and have species names like increpitus, hexodontus, communis and vexans. The narrative repeatedly includes the words “annoying”, “irritating” and “prodigious numbers”. Not much has changed since 1952. Personally, I have years of experience living with mosquitoes. So I roll down my sleeves and slip on a boonie hat from which I drape mosquito netting over my face. When they bite through my shirt, I rub a little geraniol, citronella and spearmint oil on my shoulders and keep hiking. After a relaxing evening in camp and a good night’s sleep, I wake to the echoing trills of varied thrushes and chirps of evening grosbeaks. The morning is cool enough that I slip into my puffy down jacket while drinking a cup of green tea. It’s so good to be out! I love the simplicity of life in the woods. Without looking at my map, I head out for the day. I know exactly where I am going: up the Waptus Pass Trail. This terrain was shaped when the last glaciers retreated at the end of the last ice age. Big U-shaped valleys, shallow at the bottom and steep in the sides. Not only steep, but littered with the rubble of rocks left behind. Under the thin forest soil is a layer of rounded cobbles. Sections of the trail are like walking on big ball bearings. Every year the trail crew heaves rocks out of the trenches that form, but it doesn’t help much. Short switchbacks zigzag up the brow of a the ridge. It’s sweaty hiking. After some climbing, the trail grade moderates and I wander through the woods and descend to a creek crossing. Time to replenish my water supply. New to me this year is a Katadyn Hiker Pro water filter from Switzerland–a lightweight durable unit. I haven’t swallowed unfiltered water from the backcountry since I was a teenager, having witnessed friends suffering from giardiasis. Waptus Pass is a hanging valley scooped out of Polallie Ridge, sprinkled with swampy meadows and stands of subalpine forest. The air is scented with tangy red heather and musty yellow cedar and something else I can’t quite place. It’s a warm earthy green growing smell wafted about by the breeze. I’m elated that there are no mosquitoes here and there’s a spring in my step as I explore ahead. No people either. After checking campsites and the backcountry toilet, I turn around and head for Escondido Lake, which is tucked away two miles up a side valley. Can’t remember the last time I was there. Escondido means “hidden” in Spanish and must have been named by early 20th century sheepherders. After making my way over three foot snowdrifts, I emerge into the basin. The lake itself is a shallow pond at the end of a big open meadow. I drop my pack on a log then spend some time hurling rocks and hauling away charcoal from campfires. Then I do what I really want to do, which is loll around in the flowery meadow for a little while. The summer sunlight feels so benevolent at high elevation. The air smells good and is filled with echoing birdsong. I savor the colors of the conifers: blue-green subalpine fir, dark green mountain hemlock, olive-toned Alaska yellow cedar. 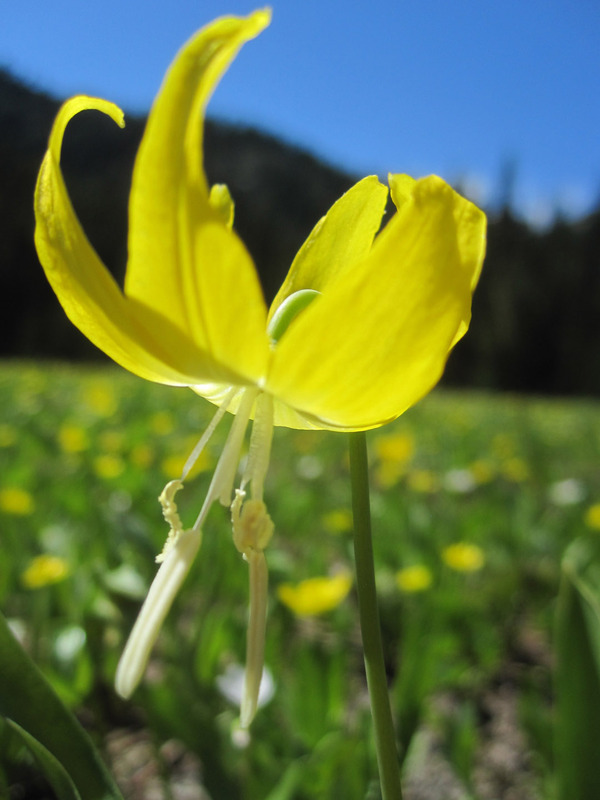 I flop onto my belly to look directly at the yellow glacier lilies and pink spring beauties that carpet the ground. They are full of buzzing insects–bumblebees and butterflies. Life burgeons here. By the time I return to my camp at Pete Lake, I have hiked 9 miles for the day and my feet ache with exuberance. The book in my backpack is Deep Survival: Who Lives, Who Dies, and Why by Laurence Gonzales. A compelling camp read, and just right for the backcountry. 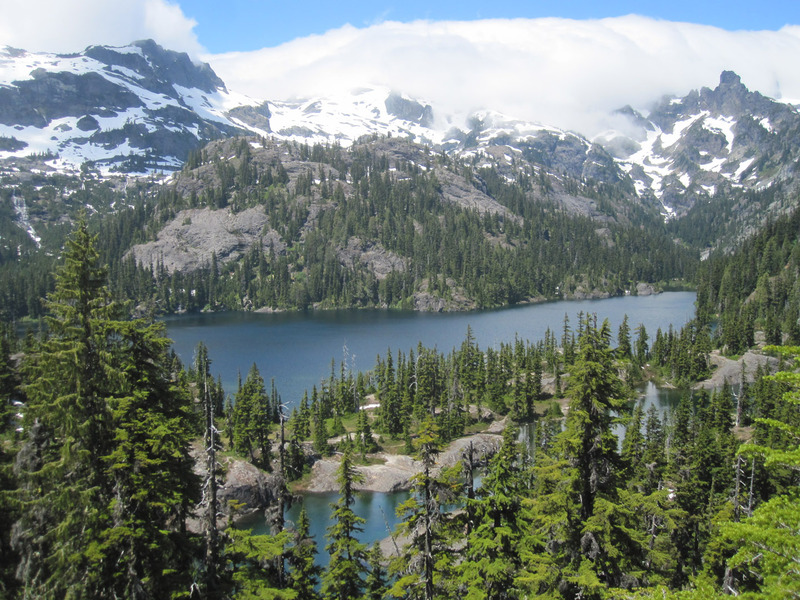 There are outdoor recreation deaths in the Alpine Lakes every year. Gonzales digs into why people take risks, and why the consequences are more extreme in wilderness settings. He hangs out with fighter pilots, interviews survivors of mountaineering accidents, and studies the case histories of people who have survived plane crashes and shipwrecks. He makes a strong case for the mind-body connection by exploring emerging neuroscience. How human brains are wired affects how the body responds. We are not as rational as we like to believe. Gonzales suggests that people who have survived other sorts of emotional trauma (major illness or injury, death of a parent, divorce, abuse, etc.) are more likely to function relatively well in an outdoor survival situation. At the end of the book, he lists his rules for adventure. They are good ones:1) Percieve, believe, then act; 2) Avoid impulsive behavior, don’t hurry; 3) Know your stuff; 4) Get the information; 5) Commune with the dead; 6) Be humble; 7) When in doubt, bail out. Sure, it helps to be trained an experienced. But mostly it’s mental. You have to want to live. You have to be where you are. I think about this all day as I hike to Spectacle Lake and back. I don’t know when or how I’m going to die. All I know is that I’m pretty sure today is not the day. The mountains are beautiful. Twelve miles by the time I get back to camp and finish the book. It’s go-home-day. I pack most of my gear and say good morning to my neighbors at the next campsite. Their three well-behaved dogs have greeted me each evening when I return to camp and I enjoyed our conversations. Lots of questions about the area, what bird is that, and so on. I am able to tell them the whoofing sound they thought was an owl is actually a grouse announcing his territory and trying to attract a mate. While they pack up, I am on my way to Lemah Meadow to check campsites. It’s a short morning stroll of a couple miles. After returning to my camp, I load everything into my big red backpack, take one last look around, and head down the trail. There are more campsites to visit on my way out. One of them has a campfire smoldering away and no one around. The people come back, a dad and his six-year old boy. It’s their first ever backpack. We talk about campfires, especially on a breezy day with lots of dry rotten wood on the forest floor. The boy–he tells me his name is Noah–is checking out my ranger uniform as I demonstrate how to properly extinguish a campfire. His dad asks about other trail suitable for kids, and I pull out my maps. Noah listens as I talk about good places to camp, how far the walk is, how steep. When I refer to my field notebook, he holds out his hand to see what I have scribbled. He is paying attention, and I direct much of the conversation toward him. His eyes are steady, calm. This kid would survive. Who knows what seed has just been planted and whether it will grow? It does my heart good to see parents taking their kids outside and letting them be kids. This is the real experience of wilderness, even though it’s not very far in. Each step takes me closer to the wilderness boundary, to the road and the truck and then that disconcerting transition to where people drive and talk on telephones and live in houses. It shakes me every time, this going in and out of the woods. Would I choose another trail if I could? Nope. The take-away from Gonzales’ book–I don’t want to live in a safe and predictable world. I want to keep discovering. Height ho, indeed! I wonder if we still have the lurid orange and brown banded sheet music for that tune ? I remember it from my early days, finding it in the piano bench and begging my Mom to play it and we’d all make up our own verses – especially effective if Mom would lay on frills and pedals – from my perch under the baby grand, it was pretty darn amazing. The image of a small you under the piano is endearing. I want to see pictures! Wonderful!! Thanks, Deb. I feel as if I am there with you! Barrett, thank you for reading! Hope you are feeling less starved now, and I hope you get out there soon. Doing a thru from salmon la sac/cooper lake – Pete lake- spectacle lake-ridge lake and out Friday thru Monday. Hoping more snow melts before we get to the chikamin traverse thru Alaska mt. Holiday Ro-oh-oh-oh-oh-oh-oh-oh-oh-oad, Holiday Ro-oh-oh-oh-oh-oh-oad. Guaranteed to edge out all other earworms. Oh, you are a baaaad person!